In the third pAsuram, parAnguSa nAyaki‘s friends ask “Is your act in line with our shyness and honour?” and she replies “after being captivated by his beauty, my heart lost all of those”. Third pAsuram. Everyone except one of her friends withdraw themselves saying “this is not possible for us”; that one friend said “this is not good for us; should you not control your heart and sustain yourself?”, parAnguSa nAyaki replies “What can that heart do now? It has lost everything it had by being captivated by his beautiful limbs etc”. thOzhI – Oh friend who helped our union previously! Oh friend who helped our union previously! My heart is plunged into emperumAn’s enjoyable, reddish fruit like lips; it is residing humbly under the reddish, radiant, tall, divine crown, matching its [crown’s] supremacy; it is becoming joyful seeing the divine ornaments which confirm such supremacy; it is existing exclusively for the greatly enjoyable lotus like divine eyes; it has lost its natural shyness and obedience to the benefactor who is easily approachable in this archAvathAram, highlighting his distinguished nature, mercifully residing in thenthiruppEreyil where festivals are happening continuously without a break, every day and month, manifesting himself to people like us. parAnguSa nAyaki is saying “sengani vAyin thiRaththadhAyum, senjudar nIL mudith thAzhndhadhAyum, sangodu chakkaram kaNdugandhum, thAmaraik kaNgaLukku aRRuth thIrndhum – nenju nANum niRaiyum izhandhadhu kAN!“. A muni (sage) named Saubhari, with his special power, assumed fifty forms. The one with whom she united, could do a lot more than that. Just as emperumAn could fully pervade every entity, her heart too could be captivated individually in his every limb. [Alternative explanation] The multifarious forms acquired during experience with bhagavAn as said in chAndhOgya upanishath “sa EkathA bhavathi thridhA bhavathi” (he assumes one form, three forms and so on), is happening to the heart in separation. sem kani vAyin thiRaththadhAyum – Being captivated in the divine lips which are trying to say “Whether I am away from you in separation or present in your vicinity, am I not your belonging?” That too she is not even going into in-depth experience of the divine lips [just seeing the lips from outside is captivating her]. vAyin thiRaththadhAyum – Is this experience not as big as mahAbhAratham? sem sudar … – When emperumAn spoke about the separation and stood a few steps away from her, she saw the divine crown which is highlighting his supremacy, revealing that he is the lord of both nithya vibhUthi and leelA vibhUthi (spiritual and material realms), and fell flat on the ground and held his divine feet. sangodu … – She then saw the AzhwArs (Sanka and chakra) which are the tools for him to eliminate the enemies when in separation, and which are so beautiful not to take our eyes off them, and became joyful. thAmaraik kaNgaLukkaRRuth thIrndhum – If one escapes for his words “thavAsmi” (I am yours), he/she will be captivated by his eyes; she became totally existing for him for those eyes. While separating from her, he glanced at her in such a manner that she was uplifted, to not exist for anyone else. Just as emperumAn assumed eight forms [being the antharyAmi for dhEvas, asuras, vAsuki (the serpent) and manthara (the mountain); kUrmam (tortoise), antharikshAvathAram (the form which appeared on top), upEndhram and the form which held the mountain from falling off), ] while churning the ocean, her heart took several forms to experience emperumAn’s different features. All his abilities can occur for her heart too. thingaLum nALum … – While festivals are celebrated on a daily basis in the desirable abode, would the heart remain with us in suffering! [the abode] where monthly festivals and daily festivals never stop. vIRRirundha nangaL pirAnukku – The benefactor who is manifesting such benevolent presence to us. parathvam (his presence in paramapadham) is for nithyasUris and mukthAthmAs; vyUham (his presence in kshIrAbdhi) is for for those who are comparable to mukthAthmAs; vibhavam (his incarnations such as SrI rAma, krishNa et al) is for the virtuous ones; but this archAvathAram is for the samsAris who have committed sins. en nenjam – His favours, beauty etc are like diamond-melters [which can melt my heart which is hard like diamond]. [Oh friend!] You know the hard nature of my heart. Both the heart and he are perfectly aligned [he is attached to the devotees, it is attached to him]. nangaL pirAnukku en nenjam – as said in SrI rAmAyaNam sundhara kANdam 16.15 “rAghavOrhathivaidhEhIm” (SrI rAma who matches sIthA). thOzhI – You can understand the hardness of my heart, and now you too are siding with him. nANum niRaiyum izhandhadhuvE – Is there anything which it has not lost? See what happened by his separation for a fraction of a moment! I lost myself; mothers and friends lost me; my heart lost its shyness and obedience. 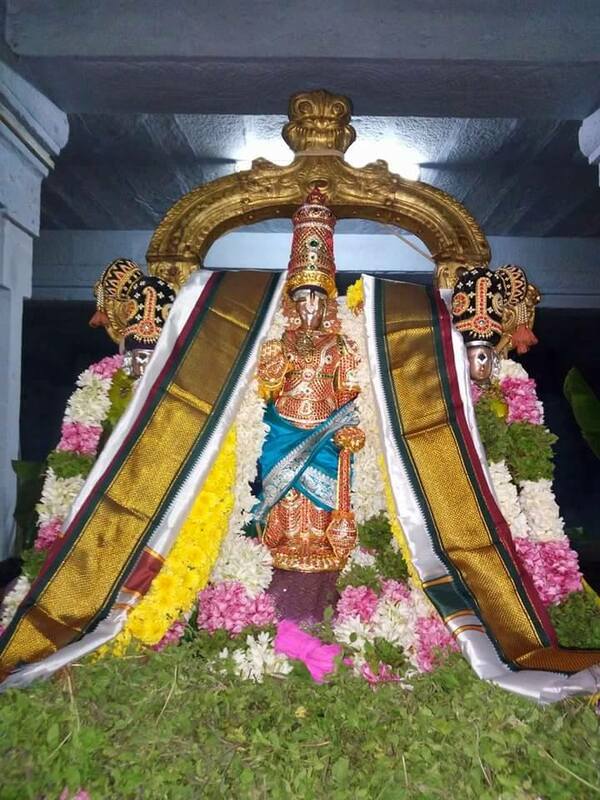 This entry was posted in thiruvAimozhi, thiruvAimozhi 7th centum on August 11, 2018 by Sarathy Thothathri.